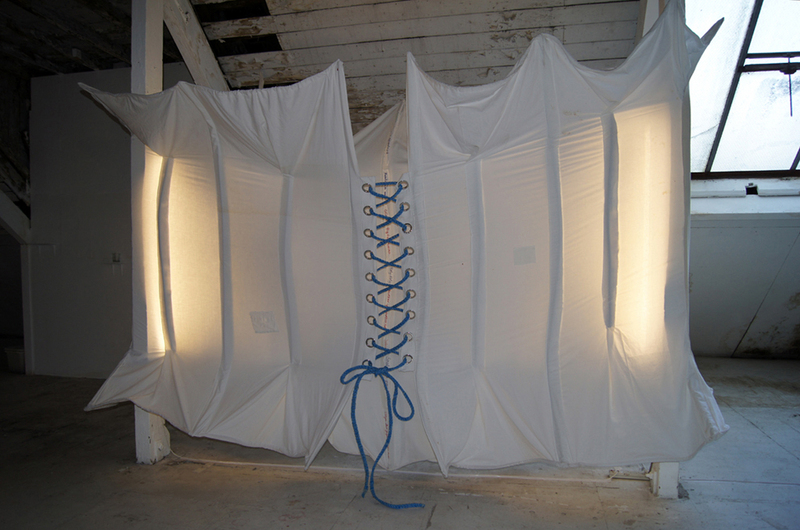 Four Queens was a site-specific installation, which is overtly feminine, celebrating the female form, which is contextualized within a specific architectural space inside a former Victorian laundry. Using the structural fabric of the first floor we stretched a number of ordinary household sheets around two of the columns to create an oversized and impossibly proportioned corset. The concept is that this echoes the constraints of our women throughout the ages whilst addressing the dilemma of the modern woman’s personal shape and identity. Women are increasingly getting bigger (both physically and mentally) .We find ourselves bullied by the media and society to be slim. The stretched corset heightens this tension. ‘the giantess’ corset constructed by The Four Queens the creaking gallery beams; the giantess having gorged herself to her gigantic proportions now denigrates herself with pretty insults stitched into the seams of her underwear and secreted vows to castigate the body, to deny it pleasures of flesh and hungering stomach…’.